Spectre (2015) appears to be Daniel Craig's last 007 film. His four James Bond films—Casino Royale (2006), Quantum of Solace (2008 ), Skyfall (2012), and now Spectre—tell a single unfolding story. This is unusual for the film franchise which started back in 1962 with Sean Connery playing the writer Ian Fleming's James Bond in the film Dr. No. Generally speaking, the Bond films have been stand-alone spy capers. Yes, each film has some kind of cat-and-mouse intrigue, the martinis are shaken not stirred, the tuxedos firmly pressed and, like clockwork, 007 will inevitably introduce himself as "Bond, James Bond" but repeating themes, motifs, props, signature moments along with the distinctive soundtrack all make a James Bond movie a James Bond movie regardless of who's playing 007. However, Eon Productions (which has produced all 24 of the official James Bond films) gambled big on Daniel Craig back in 2006 when they went all-in on the idea of producing a series of films focusing on Bond’s back-story with an unfolding narrative linking the films. Bond's lack of personal history had long been a selling feature of the franchise as viewers could put themselves into 007’s shoes for a couple hours of pure escapism without being distracted by his issues and mounting troubles. As Spectre begins viewers are confronted with a title card reading "the dead are alive." Unaware he's hot on the heels of his personal past Bond finds himself in Mexico City amidst the festivities of Día de Muertos, the Day of the Dead. He’s seeking to avenge the death of M (Dame Judi Dench) who, at the end of Skyfall, was murdered by Mr. Silva (Javier Bardem). M had charged Bond with a mission: if she should die, he should find a man named Marco Sciarra, kill him, and see who comes to his funeral. By doing this she hoped to shed light on a mysterious crime syndicate operating deep in the shadows of international terror and espionage. While seeking to uncover this organization, which he learns is call Spectre, Bond comes face-to-face with someone from his past who he'd long thought was dead. In Craig’s four Bond films the wreckage 007 leaves in his wake creates international incidents and political hot potatoes which call into question the need for 'cold war'-style spies in a new world of digital surveillance and drones. Meanwhile, the new M (Ralph Fiennes), head of Britain’s international secret intelligence service MI6, is left to clean up Bond's mess back in London as the government seeks to merge MI6 with the United Kingdom's domestic counter-intelligence service MI5. 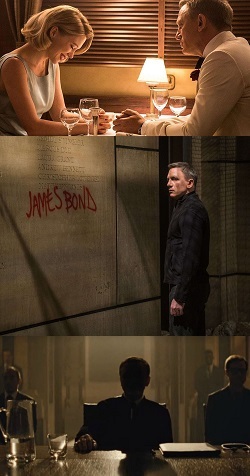 When Sam Smith, in the opening theme song, croons the line "the writing's on the wall" (which is also the title of the theme song), it quickly becomes clear that Spectre isn't just one more adventure in a string of Bond adventures but rather a film about conclusions, about things coming to an end. The popular phrase "the writing's on the wall" started its life in pop-culture as a Biblical allusion to an incident recorded in chapter five of the Old Testament book of Daniel when, after being callously insulted by the Babylonian king Belshazzar, God sent a hand from His presence to inscribe a message on the king’s wall. The prophet Daniel interprets it for the horrified Belshazzar and basically tells the king that 'God numbers a man's days and brings them to an end; God is the judge of a man; and in the end God gives what one man has to others.' That night Belshazzar is killed and his kingdom goes to another. Today the phrase "the writing's on the wall" generally means the end is near or the end is at hand, and someone or something is about to be judged. This brings viewers around to the question at hand: What is the measure of this man James Bond? Who is he? Why does he act the way he does? Starting with Casino Royale it's inferred that Bond is an orphan. Quantum of Solace shows his deep affinity for people who are orphaned at the hands of violent men as Bond helps a woman, Camille Montes (Olga Kurylenko), with her quest for vengeance against the men who brutalized and murdered her family. Skyfall reveals that Bond is indeed an orphan himself, and as M says, "Orphans always make the best recruits." In Casino Royale he fell in love and tragically lost a woman he suspected of being an orphan, Vesper Lynd (Eva Green), and two films later in Spectre Bond falls for Madeleine Swann (Léa Seydoux) a woman he knows is an orphan, the daughter of one of Spectre's assassins, who is described as the only woman who could truly understand and love him. Madeleine Swann asks Bond, "Why, given every other possible option, does a man choose the life of a paid assassin?" Bond replies, "Well, it was that or the priesthood." In Quantum of Solace when confronted with the death of Casino Royale's villain Le Chiffre (Mads Mikkelsen) who was supposed to be handed over to the CIA, Bond quips, "if [the CIA] wanted [Le Chiffre's] soul, they should've made a deal with a priest." While it might be amusing to think of what James Bond would be like as an Anglican priest, Lutheran viewers may want to take note of a false dichotomy this idea presents: the priesthood is a virtuous vocation and government intelligence agent is a vocation of vice. The Lutheran Confessions are clear that one vocation cannot be held up as holier than another. Each vocation has its temptations and the priest or pastor who sleeps with married women and kills mission opportunities just like Bond kills every possible lead would disqualify himself in his vocation. St. John the Baptizer in the Gospel of Mark admonishes the concerned soldiers who come to him asking, "And we, what shall we do?” he says to them, “Do not extort money from anyone by threats or by false accusation, and be content with your wages.” Essentially, whatever the vocation do the job with honour. Understanding why the character of Bond is a damaged soul in need of redemption doesn't excuse his behaviour on the job. With Daniel Craig's Bond the question is asked, "Is Bond a good spy or not?" Surprisingly, the answer seems to be no; Bond is simply a lucky spy who seems to succeed in spite of himself. He’s resourceful and displays impeccable fortitude and determination but he is equally flawed with vanity, pride and wrath. Unlike most other Bond films these last four films seem bent on calling Bond to repentance, admonishing him for his mistreatment of women, and pointing out his failures—physically, socially, and psychologically. With his repeated quips about the priesthood it would appear this Bond is also thinking about his life’s spiritual dimension. Is Spectre the best James Bond film? No. Of the four recent films director Sam Mendes' Skyfall is the best. Spectre functions as the denouement for the Daniel Craig Bond films following the climax of the unfolding plot in Skyfall. Spectre reveals all the secrets of the first three films and ties up Bond's loose ends. To tell this story the film sets aside nearly all the cheesy campiness and unrestrained bravado of the previous Bond films. Spectre is dark with surprisingly little dialogue. The action is intense and the mood rather sombre. For the best viewing experience take the time to watch the three previous Daniel Craig Bond films then head to the theatre. That said, viewers coming in completely cold to this film will get the expected high-intensity 007 film. However, they will likely not pick up on the many details connecting Spectre to the previous three films or the significance of those details to the character of James Bond. Spectre is a satisfying conclusion; Eon Production's big gamble on a sustained narrative, while unexpected, has paid off giving viewers an interesting more self-aware Bond. Rev. Ted Giese is associate pastor of Mount Olive Lutheran Church, Regina, Saskatchewan, Canada; a contributor to Reformation Rush Hour on KFUO AM Radio, The Canadian Lutheran and Reporter; and movie reviewer for the “Issues, Etc.” radio program. Follow Pastor Giese on Twitter @RevTedGiese. Check out our Movie Review Index! Concordia: The Lutheran Confessions, Reader's Edition, Augsburg Confession, Article XXVII Monastic Vows, Concordia Publishing House 2006, pg 65.